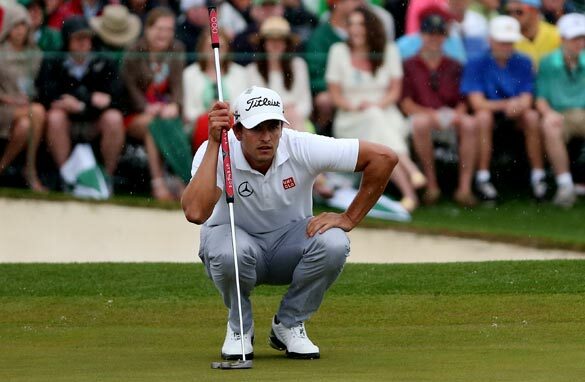 Adam Scott's broomhandle putter was one of the big talking points at Augusta. (Getty Images). This year’s Masters had its fair share of quiet periods, but in the deepening Augusta gloom it finally delivered the climax for which everyone had been hoping. A worthy, popular winner, great sportsmanship, some phenomenal shot-making - not least Angel Cabrera’s stunning approach to the 72nd hole when he knew nothing less would extend his challenge - and a final explosion of Aussie joy as the nation’s 77-year Masters curse dropped into the 10th hole along with Adam Scott’s ball in the sudden-death playoff. Last July, Scott’s family and friends stood, silent and stunned, some in tears, as they watched a TV behind the 18th green at the British Open. Their man had walked off the 14th with a firm grasp on the coveted claret jug, but as they stood there, was proceeding to bogey each of the final four holes, relinquishing what would have been his first major victory. Scott's composure and dignity in a press conference minutes later impressed many, and now he’s broken through that first major barrier, few would bet against his adding some more. Scott became not just the first Australian to win the Masters, but also the first player using a long putter to do so. Now all four majors have been won with an anchored putter. The sight of a fit 32-year-old holding aloft a long putter in ecstatic triumph, and at Augusta National of all places, will have had those opposed to the clubs feeling a deep unease. Even before this victory, Scott was the clearest example of a top pro improving his performances with an anchored putter. When I interviewed him in Shanghai at a World Golf Championships event two and a half years ago, he lamented how his putting let down his exceptional tee-to-green play. Shortly afterwards he tried a long putter in private, found it helped, and has seen a resurgence in his results ever since. The game’s governing bodies, the R & A and the USGA, are due to announce their final decision anytime now. They originally proposed a ban on anchoring (holding the putter against the chest or stomach) starting from 2016, then consulted widely. The PGA Tour and the PGA of America came out against a ban, but the European Tour supported it. Living Golf debate: Should anchored putters be banned? The PGA Tour cites a lack of data showing the method helps; those supporting a ban will now point to four major champions, and add that two other players using anchored putters (2012 British Open champion Ernie Els and the Chinese wonderboy Guan Tianlang) featured in the top three in putting stats across the week. The question now is not just whether the R & A and the USGA will press ahead with a ban (the most likely course of action) but also whether, if they do, a three-year delay could be sustainable. Scott, Els, Keegan Bradley and Webb Simpson and other anchor putters could well win more majors in the intervening period. Then any existing sense of unease would be deeper still if anchoring had been deemed unacceptable, but just not for the time being. The irony is that, until the final hole of regular play, Scott hadn’t putted exceptionally well in the fourth round. In fact far from it. On the official Masters stats, only four players putted worse all day. Nonetheless, the image of a long putter held aloft at Augusta could well come to symbolize the high water mark of the anchored club. Either way, the issue needs to be resolved immediately. 2. The Chinese aren’t coming - they’ve arrived. An Australian victory at the Masters is a great story, but Scott has been an outstanding talent for years so it wasn’t that big a shock. A 14-year-old Chinese boy not just qualifying, but then making the cut and finishing as the best amateur, is scarcely believable. Just to cap it, Guan Tianlang achieved the feat despite a harsh one-shot penalty for slow play, and finished the week joint top of the putting stats. Time and time again, the best players in the world have explained how ferociously difficult the greens are at Augusta, how it takes years of experience to work out their intricacies. Then a boy from Guangzhou turns up for the first time and putts better than everyone bar Rickie Fowler. I first met Guan in Shanghai, the same week as that Scott interview. He was 12 at the time. He won a national junior tournament on the Sunday, and told me in halting English of his hopes to make it as a professional. His victory carried with it the prize of playing in the WGC pro-am a few days later. Come the Wednesday, he stepped on to a par-three alongside Tiger Woods, swung beautifully, and cut a perfect three-wood into a treacherous green. As they walked past I asked Tiger what he thought. "You see that?!" he replied in beaming admiration. "The swing, the shot… "
Tianlang just walked calmly alongside, the offering of his cap for Tiger to sign the only clue that he was in any way conscious of the difference in status. His was a stunning performance, but he’s not alone. Last year another 14-year-old, Andy Zhang, became the youngest ever to qualify for a major (the U.S. Open) and Jin Yang, at the advanced age of 16, played in the Women’s British Open at Hoylake. Of course a few months earlier, China had got its first major success when Shanshan Feng won the LPGA Championship. The Chinese national squads are now focusing on the 2016 Olympics, when golf returns to the Games. Let’s just say one of their senior coaches is quietly confident of a decent showing. If you’re trying to uphold the principle that the rules of golf apply equally, to all people in all circumstances, it’s perhaps not ideal to crack down on a 14-year-old amateur on the cut-line in his first Masters, and extend leniency/common sense (delete as per your view of the matter) to the world No. 1 and biggest TV draw in golf. Everyone around the game has been calling for more action on slow play for years now, but Guan Tianlang’s penalty on Friday was the first time such a sanction had ever been imposed at the Masters, and the first handed out to a player in a major since Gregory Bourdy at the U.S. PGA Championship in 2010. You have to go back to 1995 (i.e. before Tianlang was born) for the previous slow play penalty in a regular PGA Tour event. Guan Tianlang dealt with it superbly, holding his nerve to make the cut then calmly accepting the penalty in post-round interviews, but he could well have pointed out that kids play slowly these days largely because they see their heroes on TV getting away with it week after week. Tiger’s reaction to Guan’s one-shot penalty ("Rules are rules") suddenly took on a sharp twist when it transpired he’d dropped a ball improperly in the same round. He escaped disqualification – the usual outcome after signing for a wrong score – when Augusta rules officials decreed the circumstances around their review of the incident to be exceptional. Instead they penalized Woods two shots. What we now need to see is the various Tours consistently applying sanctions for slow play and showing some degree of common sense over disqualification, otherwise we’ll continue to endure five or six-hour rounds and the clear impression will be left that certain rules apply more directly to some players than to others. As you may have seen on the March edition of Living Golf, we spent a little time earlier this year with Denmark’s Thorbjorn Olesen in his home city of Copenhagen and then again in Florida. This was his first Masters, having broken into the world’s top 50 late last year. His long-time coach told us he truly believed Thorbjorn could become Denmark’s first Major champion - now quite a few others will be sharing that opinion. After an opening 78, the debutant then shot rounds of 70, 68 and 68. There was a period during that final round when it seemed he just couldn’t miss the hole. He finished as the leading European (another triumph over experience at Augusta this year) and with more birdies across the week than any other player. Nothing in golf is ever certain (ask Adam Scott, let alone the boy-genius Sergio Garcia) but Olesen proved beyond doubt that he belongs in the world’s elite. While you may say a slow penalty was unfair, how many other players had to be warned, and not only warned, but warned multiple times? As far as Tiger, well, in my opinion part of sports is bad calls. Torres should have gotten a PK in the closing minutes against Man City this weekend. Jim Joyce blew Gallaraga's perfect game. Lots of ambiguity over Brett Hull's Stanley Cup winning goal in '99. Allowing TV viewers to try and correct every play is ridiculious. Go with the ruling on the playing field, if it was bad, deal with the officials later. You win some, you lose some. Wow, such a boring sport needs more of this kind of drama! I mean, do people actually watch those golf matches or really just watch the putting highlights later and enjoy the climatic drama added on by announcers and statisticians? I say, the more controversy the more it makes it interesting! That putter is available to all, just like new and improved balls that fly farther. If you're slow to adapt to better equipment and methods, well, you're slow. Couldn't say it better "... part of sports is bad calls..." and yes, allowing TV viewers to be 'officials' is ridiculous and should be stopped (a bad way of trying to build television ratings). In golf players don't try to get away with bad calls. They call penalties on themself. Tiger, by his own admission, broke the rules and then signed an incorrect scorecard. From then on its not a question of what the rules officials do, the onus is on Tiger to do the right thing. He chose not to. Mastering putting without mechanical aids is one of the many maddening and alluring aspect of golf and is one of the things that make it a great game. Anchored putters provide a mechanical advantage and helps eliminate one variable in the putting formula. I hope it is banned. What seems ludicrous to me is that viewer call-ins should have any effect on officiating the tournament. There's enough big money floating around in golf that–like in any other sport–enough officials should be on the scene to watch what goes on and take the appropriate steps when they see irregularities. Reacting to anonymous "callers" is bush-league at best. Several players have been warned and put on the clock. Guan was the first one in years to be told he's on the clock, then be told the clock ran out, then have the clock run out again. I he was the first player in 50 years to leave a divot on the green would you say he shouldn't be penalized? On Tiger's penalty, the officials checked it and said he was okay before he signed his scorecard. That should be the end. Letting someone can from home and open a new inquiry is ludicrous. What if someone calls in and says Orta was out; do we give the World Series to St Louis? And now it appears that Tiger was preparing to take the drop too close, then stepped back two yards to the right place. He thought he had stepped behind the right place, and that is what he said, but pictures make it clear his drop was good. Anchoring putters gives unfair advantage to those who use them, they should be banned completely to level the game. As long as anchored putters are available to everyone than, they should be OK.